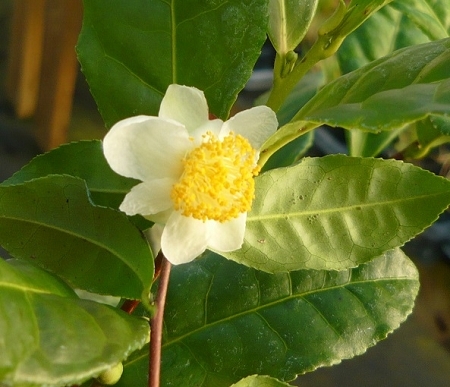 Tea Plant (camellia sinensis) - Leaves are used to make green tea, black tea, oolong tea. Attractive small bush/tree growing to approx. 8 ft. New growth leaves are picked to brew fresh green tea or leaves can be dried for later use. Black tea and Oolong tea can also be made from leaves with additional processing. Plant features small white camellia like flowers when in bloom. Attractive as a landscape plant or can be trimmed to a hedge. Stays evergreen during the winter months for us here in zone 8. Can also be container grown and overwintered indoors in colder climates. Prefers full sun. Not fussy about soil conditions and can be quite drought tolerant once established. Perennial zones 7-10. Live plant in 3 inch container.